You probably know that November 11th is Remembrance Day. 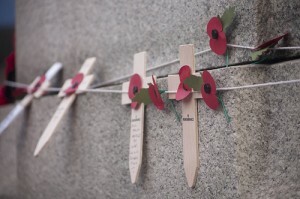 Xwi7xwa Library will be closed on Monday November 13th to commemorate this and to honour members of the armed forces who died in the line of duty. November 8th is not a federal holiday and but the date is still important. This is Aboriginal Veterans Day, a date set aside to mark the thousand of Indigenous, Metis and Inuit people who fought and died for this land. Indigenous voices are too easily lost amidst the poppies and parades, yet one Veterans group estimates that 12,000 Indigenous people served in the First and Second World Wars and the Korean War. We’re proud to hold some of these stories in our collection and to be able to highlight them this week. Please visit Xwi7xwa Library to discover further titles and find out more. Please note that Koerner Library will be closed for Remembrance Day on Friday, November 11th. The library will re-open on Monday according to our regular hours. 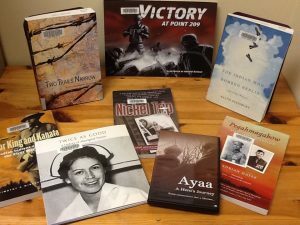 The purpose of this guide is to link teacher candidates and teacher-librarians to young adult and children’s literature, teaching ideas, images, YouTube videos and web resources that will be useful in observing Remembrance Day in BC schools. World War II and the American Indian / Kenneth William Townsend.